The state of India’s press – which played such a pivotal role during the fight for Independence from the British – is now at a crossroads. While the sector has grown rapidly following economic liberalization, it is also struggling with unique constraints on its freedom. These include censorship of the new electronic media and undue influence yielded by corporations. For the first half-century after its independence, media control by the state in India was a major constraint on press freedom. With the liberalization of the economy starting in the 1990s, however, private control of media has burgeoned, leading to increasing independence and greater scrutiny of government. At the same time, self-proclaimed media barons have emerged who have control over the media outlets because they own them. This has been the cause of great concern for those who have been watching the media over the years. This closeness between the media and corporate India leads to a deplorable confusion of priorities. Instead of media houses relying on advertisers to fund quality journalism, the relationship becomes insidiously reversed. Advertisers and corporate units begin to rely on news outlets to further their interests. In 2003, Bennett Coleman Company Limited (publishers of the Times of India and the Economic Times, among other publications) started a “paid content” service, which enabled them to charge advertisers for coverage of product launches or celebrity-related events. In the run-up to the 2009 Lok Sabha elections, the more clearly illegal practice of “paid news” emerged and became widespread. The behind-the-scenes influence of corporate and vested interests was made particularly apparent by the leaking of tapes recording conversations between Niira Radia, a powerful lobbyist with clients such as the Tata group and Reliance Industries, and a variety of business men, politicians, and journalists. They revealed what had long been an open secret: the collusion and uncomfortable closeness among corporate units, politicians and journalists, a world in which the line between politics and business, public relations and news, is increasingly blurred. That many media companies argue in favour of relaxed legislation with regard to media consolidation is not surprising, when one considers the difficulties of breaking even, let alone making money, in the business. From a business point of view, media consolidation has undeniable advantages. It allows for economies of scale, which enable media companies to absorb the costs of content and distribution over a large volume of revenue. This in turn allows companies to invest in better resources such as talent or technical equipment. In a competitive market, small media companies have a very hard time surviving. Consolidation makes a lot of economic sense and can even, to some extent, translate into improvements in quality. Some nations can influence and control their media greatly. In addition, powerful corporations are becoming major influences on mainstream media. 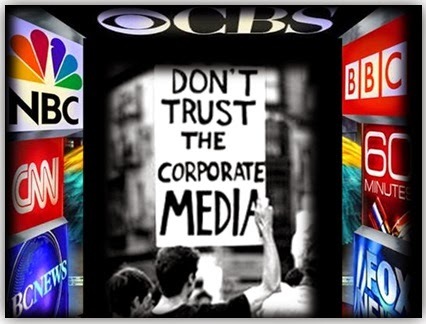 In some places major multinational corporations own media stations and outlets. Moreover, even as numbers of media outlets increase, the ownership is becoming ever more concentrated as mega mergers take hold. At the same time, vertical integration gives the big players even more avenues to cross-sell and cross-market their products for even more amazing profits. An effect of this though is a reduction in diversity and depth of content that the public can get, while increasing the political and economic power of corporations and advertisers. An informed population is crucial element to a functioning democracy. As advertising becomes more important for businesses, larger companies are able to spend more and more on sophisticated ways to make us buy their products. Advertisers also exert direct and indirect influence on the media companies and their content in order to foster moods and cultures where consumers are more likely to buy their products. As a consequence, dumbing down of content is not uncommon. Media companies sell consumers to their customers, the advertisers, who bring in the money that allows media companies to survive. When someone speaks of media manipulation, they can mean both manipulation by the media and manipulation of the media (by business lobbies/politicians/self-serving interest groups etc.) Manipulation of the media does not require that every last media source goes along with it. It comes down to which media outlets are given cultural authority, and by whom and for what reason. It's never a simple matter of taking sides. These big media organizations end up being a public relation mechanism for the big Corporations and their boards of directors are connected with a plethora of other major global corporations and elite interests. Haven't these strategies been in existence for a very long time? Most of them were developed during the sustained European colonialism of over 500 years and refined through the hapless participation of their conquered subjects. Yes, modern technological advances have enabled these strategies to be put in place with much more widespread impact. Though it would seem that some of the world is waking up from their prolonged sleep! Who owns the mass media in India? That is a rather difficult question to answer. There are many media organisations in the country that are owned and controlled by a wide variety of entities including corporate bodies, societies and trusts, and individuals. Information about such organisations and people is scattered, incomplete, and dated, thereby making it rather difficult to collate such information leave alone analyse it. Nevertheless, a few salient aspects about media ownership stand out from the inadequate information that is available. Political parties and persons with political affiliation own/control increasing sections of the media in India. The promoters and controllers of media groups have traditionally held interests in many other business interests and continue to do so, often using their media outlets to further these. There are a few instances of promoters who have used the profits from their media operations to diversify into other (unrelated) businesses. The growing corporatization of the Indian media is manifest in the manner in which large industrial conglomerates are acquiring direct and indirect interest in media groups. There is also a growing convergence between creators/producers of media content and those who distribute/disseminate the content. The Indian media market differs from those of developed countries in several ways. For one, India is a developing country and all segments of the media industry (including print ) are still growing unlike in developed countries. The media market in India remains highly fragmented, due to the large number of languages and the sheer size of the country. Despite these impressive numbers of publications, radio stations and television channels, the mass media in India is possibly dominated by less than a hundred large groups or conglomerates, which exercise considerable influence on what is read, heard, and watched. One example will illustrate this contention. Delhi is the only urban area in the world with 16 English daily newspapers; the top three publications, the Times of India, the Hindustan Times, and the Economic Times, would account for over three-fourths of the total market for all English dailies. Debates on media ownership are almost as old as the nation itself. The country’s first Prime Minister Jawaharlal Nehru and his Defence Minister V.K. Krishna Menon would castigate the “jute press” in a clear reference to BCCL which was then controlled by the Sahu-Jain group which also controlled New Central Jute Mills. Then came references to the “steel press”. The Tata group, which has a substantial presence in the steel industry, used to be a part-owner of the company that publishes the once-influential The Statesman. Ramnath Goenka, who used to head the Indian Express group, made an aborted attempt in the 1960s to control the Indian Iron and Steel Company (IISCO). What was being clearly suggested by politicians was that particular family-owned groups would use their news companies to lobby for their other business interests. According to research conducted by Dilip Mandal and R. Anuradha, that has been published in Media Ethics (Oxford University Press, 2011), the boards of directors of a number of media companies now include (or have included in the past) representatives of big corporate entities that are advertisers. The board of Jagran Publications has had the managing director (MD) of Pantaloon Retail, Kishore Biyani, McDonald India’s MD Vikram Bakshi, and leather-maker Mirza International’s MD Rashid Mirza; besides the CEO of media consulting firm Lodestar Universal India, Shashidhar Sinha, and the chairman of the real estate firm JLL Meghraj, Anuj Puri. The board of directors of HT Media, publishers of Hindustan Times and Hindustan, has included the former chairman of Ernst & Young K. N. Memani and the chairman of ITC Ltd Y C Deveshwar. Joint MD of Bharti Enterprise Rajan Bharti and MD of Anika International Anil Vig are a part of the TV Today’s Board of Directors. The board of directors of DB Corp (that publishes Dainik Bhaskar) includes the head of Piramal Enterprises Group, Ajay Piramal, the MD of Warburg Pincus, Nitin Malhan, and the executive chairman of advertising firm Ogilvy & Mather, Piyush Pandey. NDTV’s Board of Directors has Pramod Bhasin, President & CEO of the country’s biggest BPO company GenPact as a member of its board of directors. Media companies tend to have a variety of professionals on their boards, such as investment bankers, venture capitalists, chartered accountants, corporate lawyers, and CEOs of big companies. Professional journalists, ironically, rarely figure. As a result, those at the top of the decision-making hierarchy are those for whom the bottom-line, not the by-line, is most important. Media companies that own the leading Hindi and English news channels -- NDTV, TV18 and TVToday -- initially forayed into broadcasting when Doordarshan commissioned them to produce current affairs and then news bulletins. Such commissions for weekly and then daily capsule enabled these small companies to grow as they gradually invested in infrastructure and in a national network of reporters. All this came in handy when, following the de-regulation of news broadcasting in year 2000, these firms ventured out on their own. A less explored dynamic of the corporatisation of the media, and particularly of broadcast news is financialisation, i.e., a process whereby financial markets and financial institutions gain greater influence in the operation of a company. To understand the nature of financialisation underway in a media company, different sets of inter-related measures can be used. The first measure is the capital structure of the company, since it provides its first contact with the financial system. The second involves tracking developments within the company during and after its listing in the stock market. Although these two measures of financialisation form the subject of analysis here, other measures include the nature and levels of financial indebtedness of a news broadcaster, the ways in which the membership of the board of directors of a news broadcaster are interlocked with those of financial entities; and, the non-news corporate practices of a broadcaster and their holding company, especially the creation of purely financial subsidiaries. The political system in India is close in spirit to the model of liberal democracy. In the constitution of India the power of the legislature, executive and judiciary have been thoroughly demarcated. The party system in operation is a competitive one with flexibility of roles of government and opposition. There is also freedom of the press, of criticism and of assembly. Indian democracy has always attracted attention worldwide and has made scholars to ponder over the secret of its success amidst considerable odds. In India diversity is almost everywhere and it is not a developed nation. The problems of poverty and inequality in distribution of income have been constant irritants. Nevertheless, till today democracy has survived in the country. The role of media in India, the largest democracy of the world is different from merely disseminating information and entertainment. Educating the masses for their social upliftment needs to be in its ambit as well. In a country where there is large scale poverty, unemployment and underdevelopment media has a responsibility towards developmental journalism. It has a role to play behind formation of public opinion which can force the political parties to address the core issues haunting the country's progress. However, public opinion can be manipulated by vested interests to serve their own goals .Media can conceal facts and project doctored ideas to influence the electorate and thereby the voting outcome. Values like objectivity and truthfulness in presentation of news and ideas can be totally done away with. In India public service broadcasting was given much importance after independence. It was used as a weapon of social change. AIR (All India Radio) and Doordarshan, the public service broadcasters in the country had the responsibility of providing educational programs apart from information and entertainment. However, it needs to be taken note of that the public service broadcasting system in the country was closely identified with the state. A monopolistic media structure under state control has the threat of becoming the mouthpiece of the ruling elite. The scenario was bound to change with the opening up of Indian economy in a bid to integrate with the global system. It signalled the emergence of a competitive market in the field of media with public service broadcasters getting challenges from private entities. This, however, had the seeds of a new problem of ownership. Ownership pattern of media across the globe and in India is a cause for concern. There are big corporate houses who own newspapers and television networks. A higher concentration of ownership increases the risk of captured media . Media independence in such a scenario gives way to safeguarding the interest of the owners who may not serve social responsibilities. The space for plurality of ideas is eroded sending ominous signals for democracy. In many democratic countries media ownership has reached dangerous levels of concentration. He has cited the examples of News Corporation's (owned by Rupert Murdoch) 37 % share in United Kingdom's national newspaper circulation and Silvio Berlusconi's ownership of top three commercial television channels, three pay TV channels and various newspapers and magazine in Italy which act as his political mouthpieces. Transnational powerful media organizations are in operation in India post liberalisation. These are big multinational corporations who own a chunk of the mass media market ranging from newspapers, television, radio, book publishing to music industry. Five of world’s largest media conglomerates include General Electric, Walt Disney, News Corporation, Time Warner, Viacom and CBS. In India there are big players like the Times Group and ABP who rule the roost in the media arena. In a bid to open up the Indian market 26% foreign direct investment has been allowed in news publication and 74% has been allowed in non news segments by the Government. 100% foreign direct investment is available in the film industry. 100% FDI is also allowed in television software production subject to certain government norms. Cable networks and FM Radio networks have FDI limits of 49% and 20% respectively (FICCI and PwC,2006).Research undertaken by PricewaterhouseCoopers has shown the FDI investment trend across mass media in India. Virgin Media Asia has a holding in HT media's foray into FM radio. Financial Times (Pearson Group) has an arrangement with Business Standard; AmericorpVentures, Mauritius has a stake in Nimbus Communications which deal in television and films and Reuters UK has equity sharing with Times Global Broadcasting, the Indian entity. Therefore, across mass media options have opened up for availability of transnational homogeneous content. The growth of media conglomerates and their powerful presence has raised fears of manipulation of ideas by a powerful few detrimental to the democratic fabric. The corporate giants have also engaged in severe competition among themselves dishing out news and content which is primarily dominated by sensationalization, sleaze and glitz to capture wider markets. The disturbing trend that has emerged in the present media scenario is the use of media in the battle between rival political groups (Coronel, 2003). In fact, this new phenomenon is in operation in India with newspapers and news channels taking sides while presenting facts. The same event can be presented in two contrasting manners in two newspapers or two television channels. Coronel argues that promotion of hate speech in place of constructive debate and creating an atmosphere of suspicion rather than social trust has the danger of making people cynic about the democratic setup leading to its breakdown. While discussing the dangers associated with the developments in media it needs to be said that media in India has also undertaken roles which have strengthened democracy. The media as a watchdog of the democratic system has unearthed its various shortcomings. Investigative reporting in print and television media has helped in exposing large scale corruptions which have robbed the nation. The Commonwealth Games Scam, the Adarsh Housing Society Scam, Cash for Vote Scam and the Bofors Scam are the highpoints of the Indian media. Across newspapers and television channels voices have been raised when the bureaucracy, judiciary or other public functionary have crossed the laxman rekha. There have also been initiatives to promote community media for the citizens to air their concerns. This is a significant leap towards alternative media usage which is distant from the dominant structure. Here the importance lies more in participatory communication right from the grassroots rather than communication which flows top down. Various television channels have also given the space for ordinary citizens to air their views in the form of citizen journalists thereby promoting democratic participation. Newspapers have educated the masses by informing them of the developments in the field of science and technology. They have also expressed strong views against prejudices which harm the society. Much developmental news has also been aired through the medium of radio. Its comparative low cost and wide acceptance among poorer sections have made it a potent tool for expressing ideas beneficial to the public. Internet, a relatively newer entrant in the field of mass media, has proved to be more democratic than newspaper and television. Internet has provided the opportunity for citizens who are conversant with the medium to express their views about a number of issues. In many cases groups have been formed by likeminded people who discuss and debate over a number of decisions on the part of the government and seek new ideas for way ahead. The power of the internet can be easily judged from the developments in Egypt in recent times. Social networking sites like Facebook and Twitter were used to garner support against the regime of President Hosni Mubarak (Kuwait Times, 2010). Internet has been used by various public service organizations and N.G.Os to inform people about their objectives and also to make them aware of various initiatives on the part of the government as well as non government organisations for social upliftment. In internet the barrier to communication is minimal which helps in the formation of a participative environment. There is also greater empowerment of the users through higher level of interactivity and flexibility in choice of media outlets. The potential of the medium lies in its ability to be more personalized by offering user-created content . Nevertheless, there is the threat of advertising revenues influencing media outputs. Those who control considerable wealth have the opportunity to sway public opinion in their favour with the help of mass media. In the 2G scam the Radia Tapes controversy brought in focus the journalist, politician and industrial conglomerate nexus. Developments like these are a threat to democracy and undermine the media fraternity. Advertisements in newspapers, television, radio and at times the internet have become a part of the present election campaigns. Candidates with better funds have the edge over others in being voted to office because they can buy newspaper space and considerable air time. The real challenges that lie ahead for the media in India are to ensure that growing concentration of ownership in an oligopolistic market does not lead to loss of heterogeneity and plurality. In the absence of cross-media restrictions and with government policies contributing to further corporatization, especially with respect to the television medium, diversity of news flows could be adversely affected contributing to the continuing privatization and commodification of information instead of making it more of a “public good”. So long as the media are in corporate hands, the task of social change will be vastly more difficult, if not impossible, across the board. This is why, in the end, media reform is inexorably intertwined with broader social and political reform. They rise or fall together. I am a human creature having my ever guiding force of conscience supreme. I am blessed with the potential of about 8.4 million species of the animal kingdom. I perceived my knowledge during the period of my growth in womb of my mother. Thus I want to repay this loan of omnipresent god by rendering my services to the needful people.